If you’re living with limited mobility or pain, a walk in bath tub could be precisely what you need for your Hampton, Georgia, home. Walk in tubs are most known for their low entrance barriers that are only a couple of inches high. This makes getting into the tub as easy as stepping across a threshold. Additionally, walk in tubs are twice as deep as ordinary tubs, which allows the seats to be built in at chair height – this means no lowering yourself down to sit at floor level. Not only will a new walk in tub make you feel safe, but it can also provide you with temporary therapeutic relief for painful symptoms of conditions like arthritis, heart disease, sciatica issues, and more. 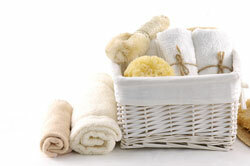 Our therapeutic tub products include aromatherapy tubs, hydrotherapy tubs, and chromatherapy tubs. While therapy tubs are by no means treatments for medical conditions, they have been known to temporarily soothe their symptoms. To learn more about our walk in bath tub options for residents of Hampton, GA, please contact us today. A representative will be happy to answer any questions you may have, recommend a product, and provide you with a cost estimate.